We're a little more than a month away from a flood of gadget news at IFA in Berlin, and we have a sneaking suspicion that an imaging centric flagship smartphone from Sony called "Honami" is going to be there. 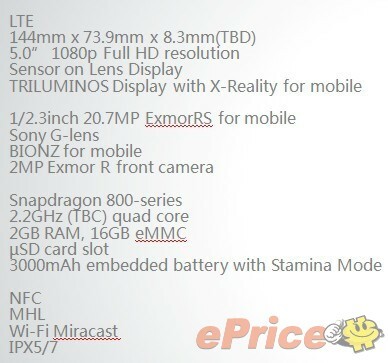 We've seen hints of what the phone's camera UI looks like, and now a leak from the Taiwanese site ePrice says the device has a 20.7-megapixel ExmorRS sensor that's the same size as the one in the Galaxy Camera and other point-and-shoots. It's also paired with a "Sony G-Lens," though hopefully not one as bulbous as some others we've seen. Other specs include a 5-inch 1080p display with the same Triluminos technology that's in the Xperia Z Ultra, Qualcomm's latest Snapdragon 800, 16GB of internal storage that can be expanded with microSD and a fairly massive 3,000mAh battery. If the alleged spec sheet after the jump is to be believed, then the Lumia 1020 and GS4 Zoom might have to face some serious competition.